A few weeks ago, I had the privilege of interviewing artist Sam Kirk about her design for the interior of The Art of Chicken restaurant. And while I was thoroughly enchanted by the rustic hand-sanded floors, vibrant cartoon chickens and custom carpentry, I’m forced to admit there was something competing for my attention. Namely, the delicious smell wafting out of the kitchen. My nose led me back to the Bucktown restaurant on a recent Friday evening where I once again found myself face-to-face with its fine-feathered mascots, El Jefe and Crazy Chico. This time though, I was less interested in the chickens’ life stories and more concerned with deciding which one of them I’d devour first. My advice for solving this culinary dilemma is, of course, to order both. And at $4.25 for a quarter chicken, that’s easily done without breaking the bank (next time order a half or whole of your favorite). I tackled El Jefe first because, in all honesty, it was the prettier of the two, with crispy, golden brown skin that glistened so much it nearly hurt my eyes. The meat was fall-off-the-bone tender and almost impossibly moist; the flavor mild, vaguely lemony and with just a touch of sweetness. 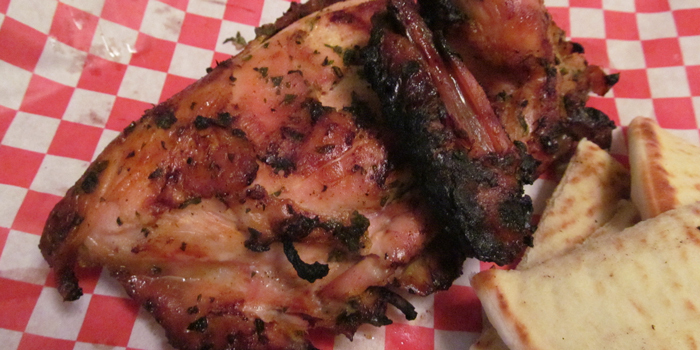 To put it simply, El Jefe is like your old familiar rotisserie chicken, only better and fresher. Many of The Art of Chicken’s Facebook friends seem to favor El Jefe, but for my part I enjoyed Crazy Chico just as much. Blackened edges deliver a burst of charbroiled flavor that more than makes up for the fact that the meat is a bit on the drier side, and a generous coating of herbs on the skin provides a fresh counterpoint to all that smoky goodness. It’s also a tad spicy. Not enough to make you reach for the water glass, but enough to make your lips feel a little tingle by the last bite. 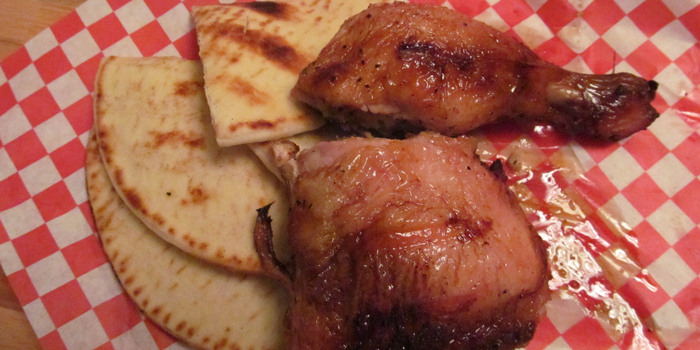 Both birds are grilled-to-order and come with flame-kissed wedges of pita bread and salsa, but a smattering of extras––Spanish rice, sweet potato fries, steamed veggies, etc––are available a la carte. 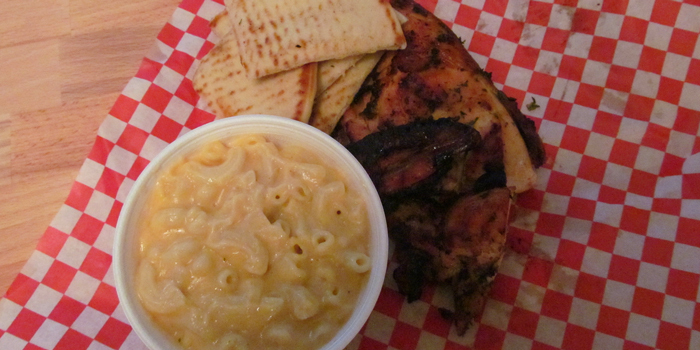 I went with the mac and cheese, which was perfectly fine. If you’re the type that can’t fathom a chicken dinner without that most American of sides, then this homemade version will do far better than its neon-orange peers. 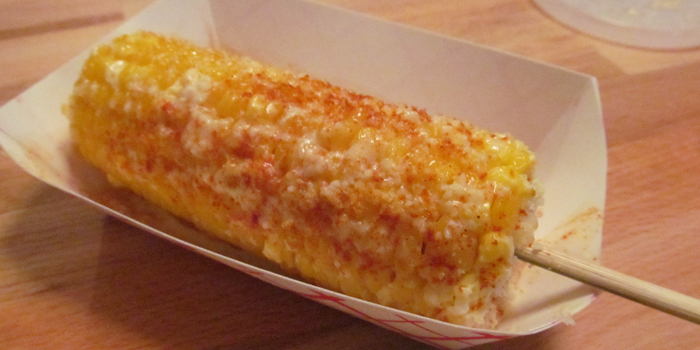 If not, then skip it and just order another ear of the sweet and spicy corn-on-the-cob. Served on a stick, Art of Chicken’s corn is boiled in buttermilk and then dressed in your choice of toppings: mayo, herbs, parmesan or chili powder. There is absolutely no reason why you shouldn’t order yours topped with all of the above. Unless, of course, you hate being happy.